Treat dry, unruly locks with the Expert Colour Care Anti-Frizz Supersize Conditioner from Jo Hansford. Exclusively developed in her Mayfair salon and utilising advanced technologies to protect and enhance natural or chemically coloured hair, the lightweight formula works to detangle and smooth hair while infusing it with essential moisture and vitamins, combating flyaways and frizz. Antioxidant-rich extracts of Sunflower Seed and Pomegranate Oil combat free radical damage and enhance hairs natural elasticity, plus the addition of conditioning Guar Gum shields against humidity and electrostatic charge, minimising fluffiness and the appearance of split ends. 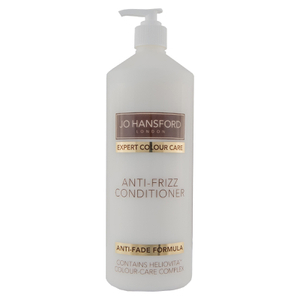 Expect manageable, silky smooth and shiny hair with a professional sleek finish and reinvigorated colour. Aqua (Water), Cetearyl Alcohol, Cetyl Alcohol, Cetrimonium Chloride, Behentrimonium Chloride, Phenoxyethanol, Benzyl Alcohol, Punica Granatum (Pomegranate) Seed Oil, Hydroxypropyl Guar Hydroxypropyltrimonium Chloride, Isopropyl Alcohol, Hydroxyethylcellulose, Limonene, Sodium PCA, Butylene Glycol, Sodium Lactate, Parfum, Disodium EDTA, Arginine, Dehydroacetic Acid, Aspartic Acid, Hydrolysed Lupine Seed Extract, Helianthus Annuus Seed Extract, PCA, Glycine, Alanine, Serine, Valine, Glucanolactone, Threonine, Proline, Isoleucine, Phenylalanine, Histidine, Sodium Benzoate.